13FOREST Gallery’s antidote to the cold and gray isSomeplace, an exhibition featuring the work of painters Marco Athié and Stacey Durand. 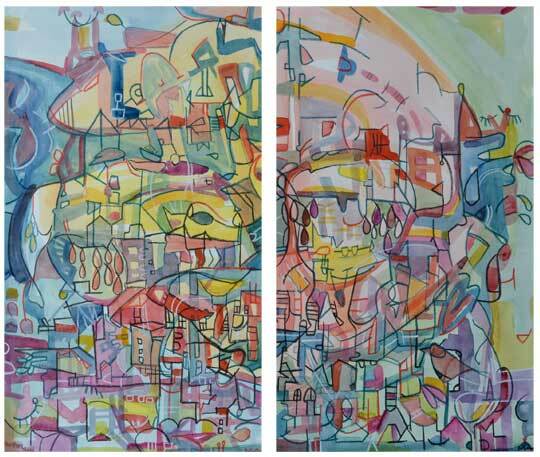 Opening Friday, March 22 with a reception from 7-9 pm, the show offers a colorful range of abstract landscapes and cityscapes based on direct observation and fertile imagination. 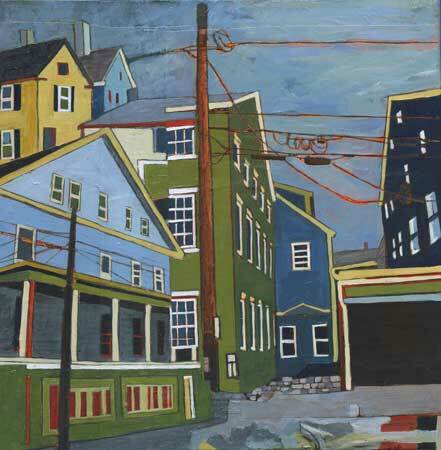 From Mediterranean-like coastal views through urban New England iconographies, Athié and Durand’s works bear thoughts of summers past and of locations yet to be seen. 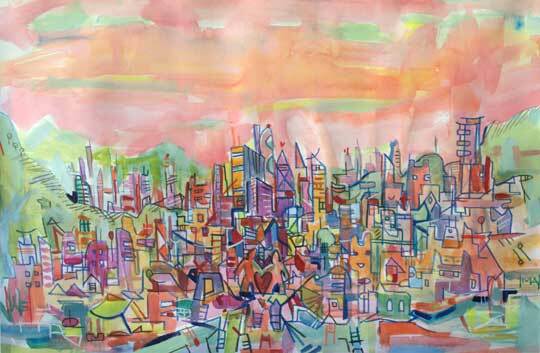 Marco Athié‘s paintings on paper are meditations on how people come together and the ecological concerns that result. 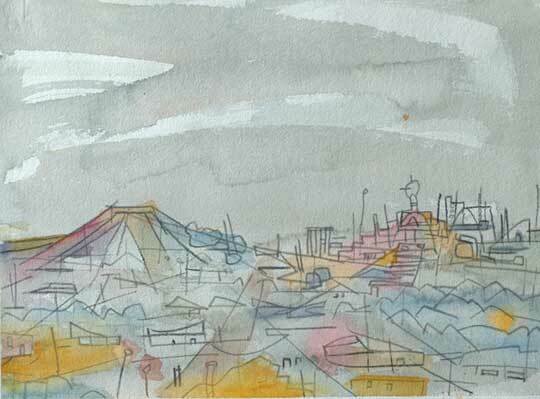 On first view, his massed, hillside buildings and landscapes seem exotic and tranquil. Yet, tucked within otherwise bright compositions are darker elements, areas in which unseen interactions occur and the world falls out of balance. Athié invites viewers into scenes of frenetic energy but advises caution along the way. 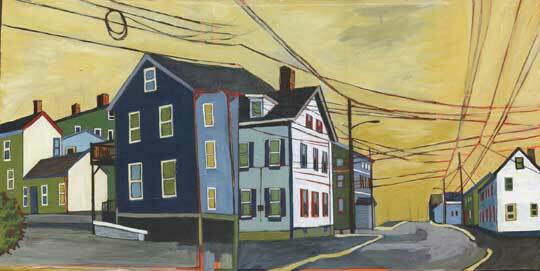 Stacey Durand is deeply influenced by the culture and communities of New England. 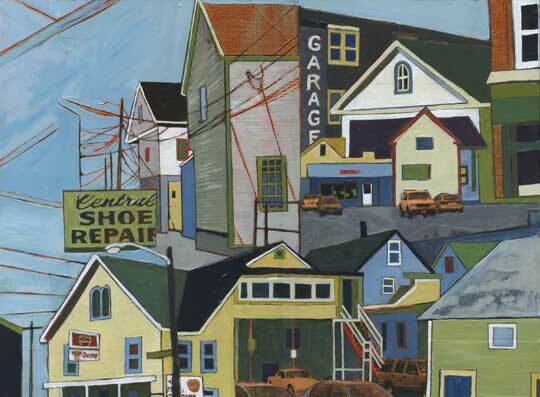 In her recent collaged paintings, she displays a fascination with neighborhood architecture, personal relationships and how the two interrelate. 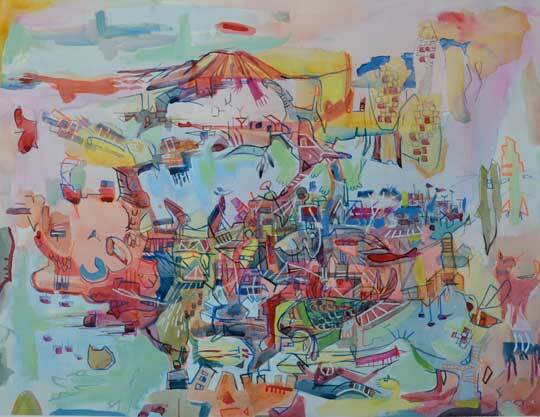 Here she disassembles aspects of place such as streets, buildings and ubiquitous powerlines, and reassembles them into cityscapes viewers have walked through but only in part. Ordinary structures surrounding all of us in this part of the world are made extraordinary and seemingly impervious to time.